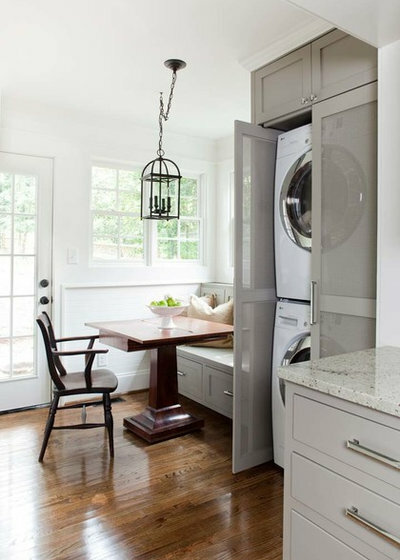 Laundry is a necessity, and for many of us, a bore — so why not do what you can designwise to make it a more pleasant experience? 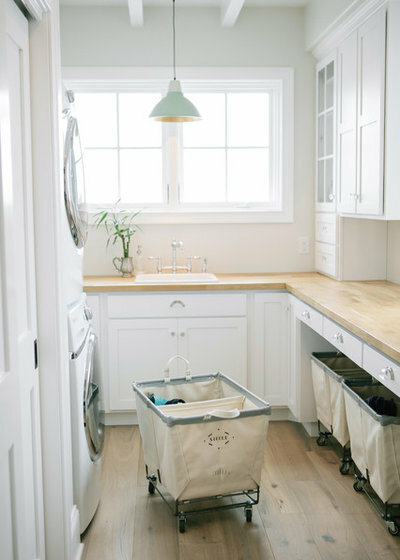 We’ve compiled our best laundry room guides to help and inspire you. Soon you’ll be singing while you suds. A question of space. 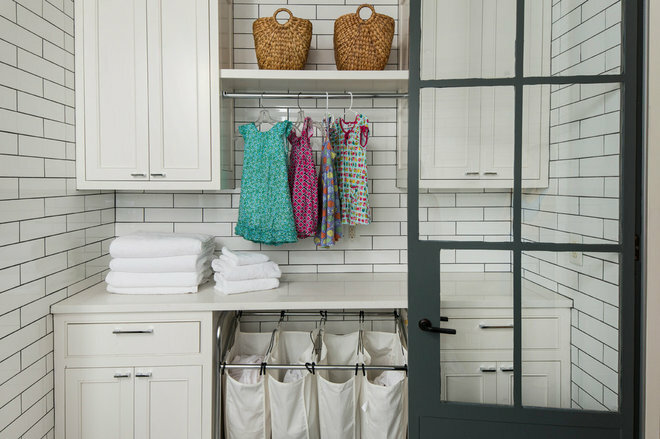 The first question when considering how to best use your laundry space is where to put it. The answer depends on several factors, including your lifestyle, how much laundry you do, and whether you care if guests see your dirty-clothes piles. 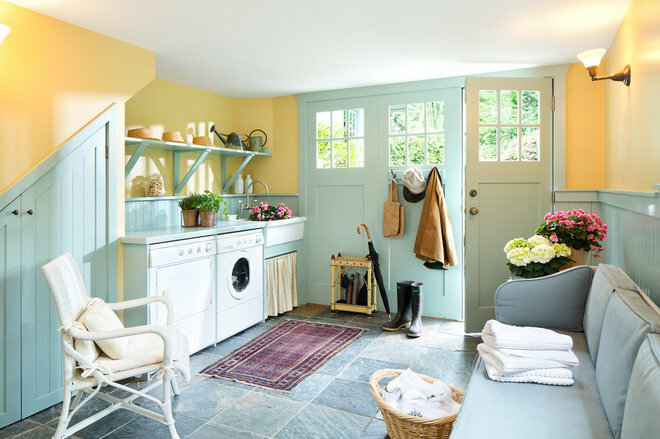 Designers say the best location for a laundry room is off the kitchen. Why? Because that’s where homeowners spend most of their time. The downside of this option in multilevel houses is that the bedrooms (and the closets) are likely on a different floor. 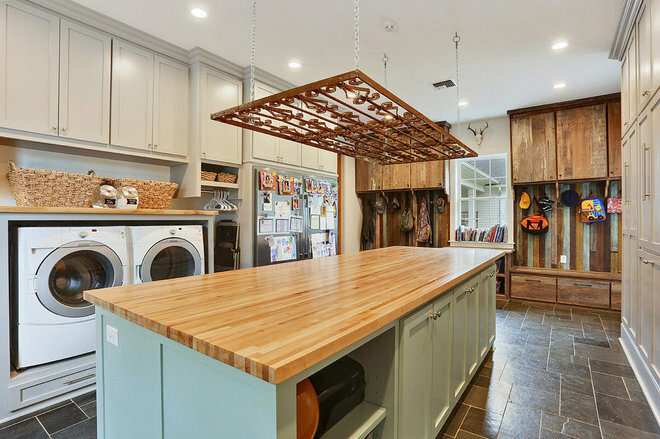 Click the link below for the pros and cons of locating the laundry room in the kitchen, a hallway closet, a mudroom, a bathroom, a spare bedroom, off the master bedroom, in the basement and in the garage. And check out the ultimate luxury: having two laundry rooms. Key measurements to know. 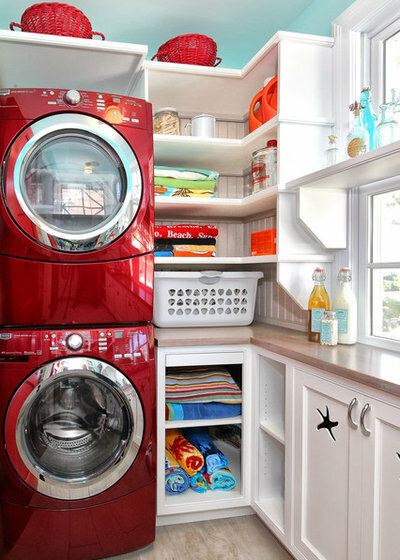 Laundry rooms have four primary areas and functions: entry and prep, washing, drying, and storage and ironing. It’s important to allow sufficient space for each function, so that your space — even if small — does not feel inefficient or cramped. You’ll want to allow at least 42 inches (107 centimeters) of width between opposite cabinets and walls. Washers and dryers that are placed side by side are typically designed to fit within 60 inches (152 centimeters) of width, although some manufacturers make smaller machines. Cabinets for laundry spaces come in standard sizes, like kitchen cabinets, with a depth of 24 inches (61 centimeters) for the base and 12 inches (30 centimeters) for the upper, and a width from 9 inches (23 centimeters) to 48 inches (122 centimeters), going up in 3-inch increments. Custom-made cabinets can be any width, but you will save money even with custom-built units if you choose the standard widths. Our guide provides you with the key laundry room measurements for creating a well-laid-out space. Organizing strategies. Not everyone has the luxury of unlimited space — or unlimited funds. Not to worry. Determined DIYers can spend very little and still get the organization they crave. In fact, one savvy family got a beautifully organized laundry space for just $409. One of this family’s strategies was stacking the appliances to free up floor space for seven roll-out sorting bins, labeled for whites, jeans, towels, delicates, darks and more. The kids now know to sort their dirty clothes into the appropriate bin. Their mom washes the items, folds them on a counter, then places them into numbered bins, which the kids are expected to take to their rooms and put away. Click the link below for more inspiring and low-cost organizing ideas. Add a dash of style. 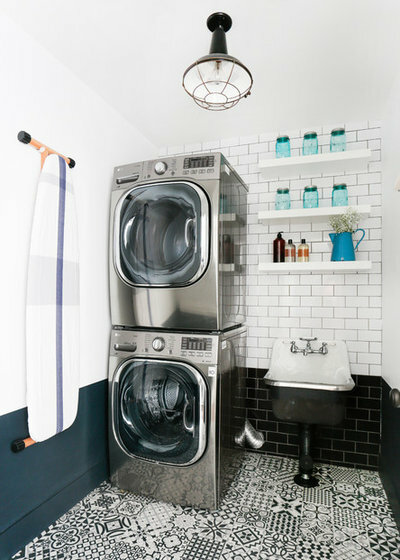 There’s no reason the laundry room has to be as drab as your dingy, once-white socks. Wallpaper, paint and floor tiles can add bright bits of happiness to your space. A lively rug can warm up the area and keep your toes cozy as you man the machines. If you don’t have a window to dress up, perhaps you can add drapery to open shelving. Or, bring in pieces you might use in your living room to give this room more importance and spirit. Before you wash, deep clean. We spend so much time keeping our clothes clean, but often neglect the machines that clean them. Our guide below explains how simple it is with just a damp sponge, some vinegar and a good vacuuming. Also, don’t neglect the lint traps. If they’re removable, you can clean them with a bit of warm, soapy water. If not, you can use cotton swabs to remove the gunk and grime. Create a routine. Having hampers, a dedicated place for hand-washables and a place to dry nondryer items is a good start. Creating a system that your family can follow will certainly make doing laundry more pleasant. One practical time-saver: doing separate loads for each person. Another surprising one: turning all the clothes right-side out before folding any. Our writer found that she was able to fold a load of laundry in nearly half the time when the contents were all right-side out to begin with. Fun extras to add. 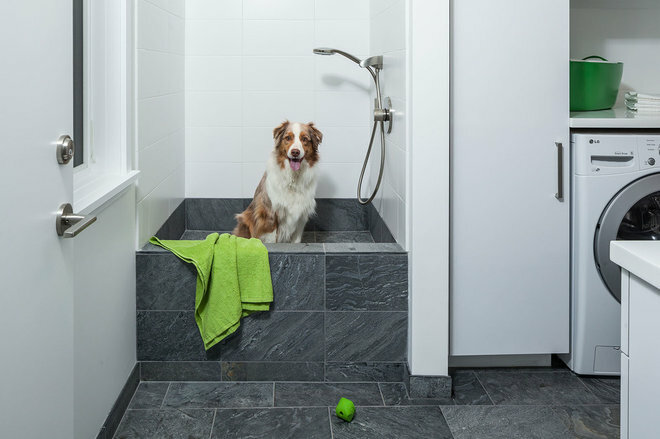 If you’ve got the space, adding a refrigerator or dog washing tub can be a great way to use a laundry space. If you like to sew, consider adding a dedicated sewing station (the ironing board will be so close!). A raised washer and dryer can ease an aching back with less bending, and a floor drain can make everyday cleaning a cinch — and act as a valuable backstop should your machines overflow. Read our guide for more ideas for making the most of your laundry space.